Facebook has introduced their latest ad format – Lead Ads. As the name and its tagline (Tap, Tap, Done) suggests, this new ad format is targeted in generating more leads from Facebook ads on its mobile app. This ad format lets you create a form and link it with a specific ad set. You can build the form from a selection of a fixed set of fields for the form during the ad creation. When this ad is tapped from a mobile phone, the form pulls up with the selected fields pre-filled from the users Facebook profile within the app itself. This makes creating Facebook ads for lead generation much more easier even without a landing page! We thought of leveraging this new ad format for our client Masters Abroad. As a pilot we converted an existing Facebook mobile newsfeed ad to lead ads, and it has worked really well. The cost per lead for this ad format has dropped down by more than 50% (as compared to mobile newsfeed) and now it is more cheaper to convert new leads. With the results from our pilot, we are publishing a quick review on Facebook Lead Ads highlighting their pros and cons. I hope this review will be helpful for digital marketers and organizations to make appropriate decisions. Bye Bye Landing Pages – Digital Marketers have been creating effective Landing Pages so that a user gets convinced and submit a form. 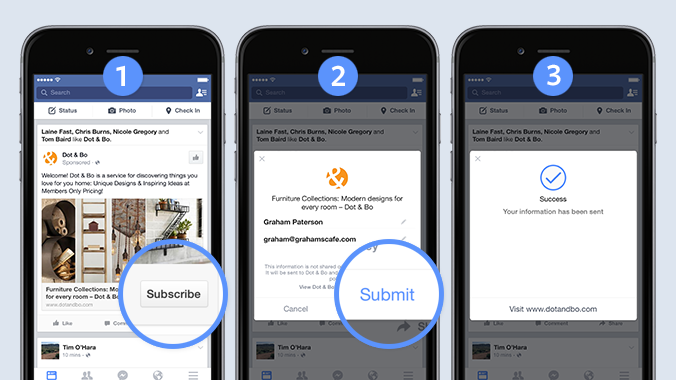 But in this, the Lead ads instantly opens up a lead generation form within the Facebook App. We no longer have the need to maintain a landing page. But this means that the ad content copy and creatives must be effective so that the users will tap on the ad and submit the form. Pre-filled But Editable Forms – The forms which are created for the ads are pre-filled with the users information. Although, the user can edit their information if in case there is a discrepancy in their Facebook profile data. For instance, if a user wants to communicate from a phone number apart from the one on Facebook, then they can alway edit the number and then send the leads. Marketing API Support – Facebook Marketing API has already started supporting Lead Ads (although with a few snags). If your ad has a different call to action other than just lead generation like sign up or subscribe, you can leverage lead ads API to initiate these actions. Lead Collection and Notifications – The leads submitted are collected under the “Publishing Tools” in the respective Page Settings which is set up with the ad set. Only a page admin can download all the lead entries in a CSV format from the page. Also there is no ‘single pane window’ available for viewing all the leads which have been collected. This may be to maintain privacy of the users submitting the forms. There are no notifications sent when a lead is generated. Businesses for whom time is of essence for the first connect with leads may find a gap in here. Available only on Power Editor – Lead ads can be created only from Facebook’s Power Editor. Since Power Editor works on Google Chrome, these ads can be created only using this. Digital Marketers who are not using Google Chrome are deprived from even knowing that such an ad format exist and need to switch to Google Chrome, fast. Although, we can see that there are fewer cons than pros it is completely on the nature of a digital marketing campaign and how these points are weighed into consideration before using this feature. Feel free to contact us if you would like to know more, checkout a demo and engage us to create your awesome digital marketing campaign using lead ads!